Ho Ho Ho says Santa! He'll be visiting us all real soon and I hope you've all been good! He'll be working hard with his elves to put something nice in your stocking, so don't forget to leave out a cookie for him and a carrot for the reindeer! Which brings me to my mani, using 3D Santa Nail Charms from Charlies Nail Art. They come in a pack of 2, are flat backed and are reusable. The Santas have a sprinkling of glitter. I attached the 3D Santa Nail Charms while my top coat was still wet however nail glue will be a more secure option. This is the second of the two manis I created. With traditional Christmas red nail polish topped with confetti glitter. This is the first of my two manis, starting off with the traditional Christmas red nail polish and gold polish underneath the Santas. However I felt my mani needed a bit of bling, after all, it is for Christmas. The 3D Santa Nail Charms currently cost £0.29 for a pack of 2. 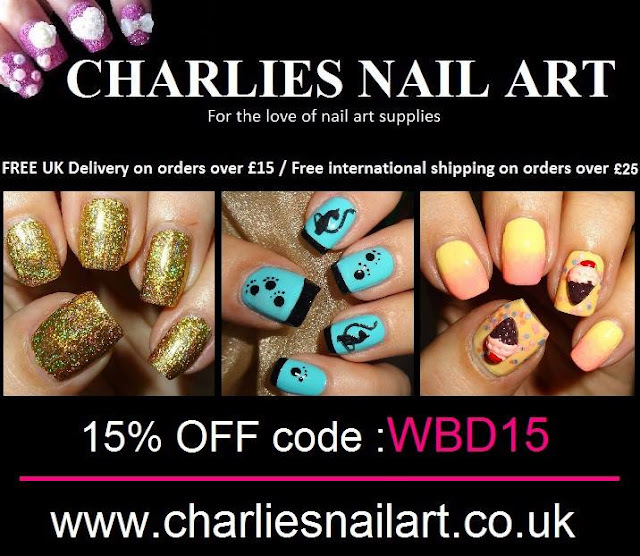 You can also keep up with all the latest Charlies Nail Art info on Facebook, Twitter, Pinterest, Instagram, Google+ & LinkedIn. Charlies Nail Art is a UK based company and ships worldwide. UK postage starts at £1.49 and is FREE on UK orders over £15.